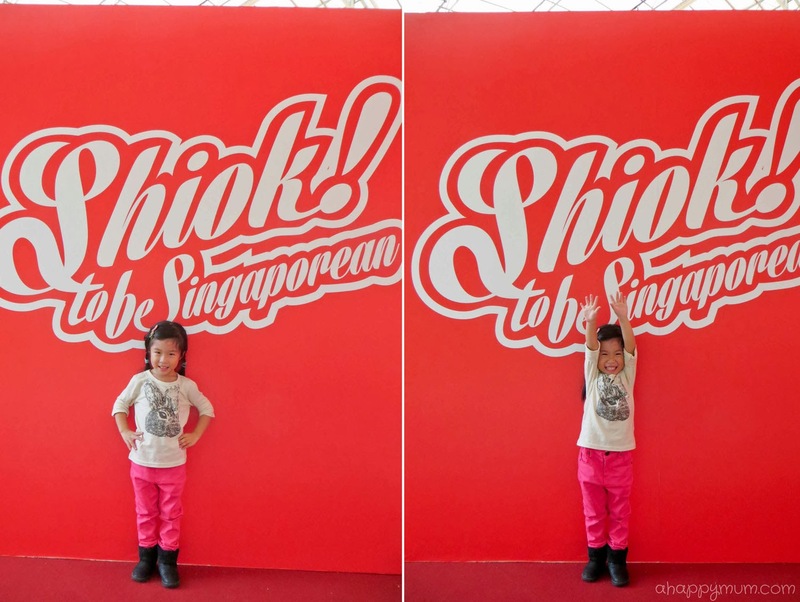 Whenever I shop for apparel for my girls, the three things that I look for are comfort, style and affordability. While it is not impossible to find all that in a piece of clothing, the hunt sometimes gets arduous and it is usually the case of sacrificing one in order to achieve the other two. Recently, we were introduced to Oria Collection which believes in giving children the best that is out there - high-quality, comfortable yet fashionable apparel. In the Perth Fashion Festival that took place in September, this being the first time that a junior/children's runway event was held, Oria Collection was also proud to be one of the features. While my girl might not have the chance to strut down the runway, she definitely had fun coming up with her own poses clad in some of our favourite picks. When I was browsing through the catalogue and laid my eyes on this rabbit tee for the first time, I knew it was going to be a big hit with the girl. Not only is the rabbit one of her favourite animals, this cute tee also comes with 3D cushioned ear flaps, one of it which droops, which she totally adores. I personally love the classical khaki skirt which features wide side pockets, tie around ribbon and an elastic waist. Yes, no buttons! Made 97% of cotton, the skirt has a slight stretch to ensure comfort while holding the shape of the skirt. Be it going for a stroll in the park, having an afternoon tea or hanging out at the mall, this outfit is perfect. If you ask Angel what her favourite colour is, you will no doubt get a loud and clear answer - PINK. So she was really excited to try out her first pair of pink jeans. These slim-fit premium cotton jeans stretch just a little to allow your child to have the freedom to run around. At the same time, they are also soft to the touch and ensure a comfortable fit. The jeans features five pockets, embroidered star on back pockets, belt loops, button and zip fastenings. It also comes with an adjustable waist so that it provides a snug fit and can be worn for months, or even years, to come. 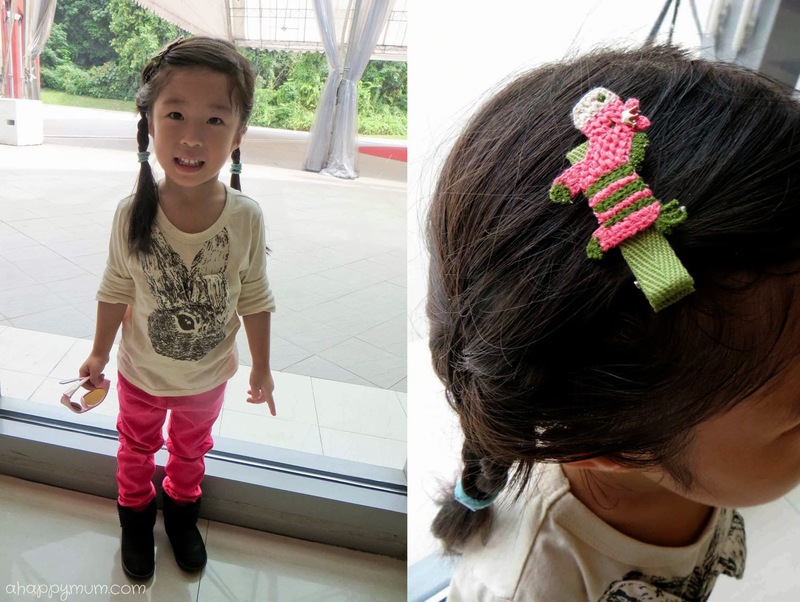 Angel is also in love with the handmade knitted pony hairclip, a special gift from Oria Collection, which is not made available in Singapore for now. On some days, you just feel like jazzing up your outfits. Or your kid's. A little sparkle has the power to brighten up your mood and even the day. I like the simplicity and elegance of this dress which comes adorned with sparkly studs at the collar. Made entirely of high quality cotton and featuring a concealed zip at the back, it not only makes your girl look fashionable but ensures maximum comfort too. Now, who says navy blue is only for boys? The one thing about Oria Collection that really appeals to me is that every design has been uniquely created, with only a handful of each being available to ensure that your child stands out from the crowd and there is least likelihood of him/her having the same outfit at a party. Comfortable, stylish, affordable. And unique. No wonder my girl feels so special and happy! Oria Collection believes in giving children the latest, fashionable, comfortable yet stylish apparel from trendsetting fashion capitals of the world. For more information, visit their website here. Note: Not all items are available in Singapore, this is stated under 'Description', and for these items, shipping fees will be charged. Here's your chance to win the Navy Cotton Dress or a Checked Shirt for your favourite boy or girl! Simply follow the below steps to enter! Good luck! Disclosure: Angel received the above complimentary outfits from Oria Collection for the purpose of writing this review. No monetary compensation was received and all accessories, shoes and opinions are our own. Would like to win the dress for my 5-year-old girl (Alicia)! :) Thanks for hosting! I think my little monster will look great in the Checked Shirt! Thanks for hosting the giveaway! I would love yo win the Checked shirt for my boy! would love to win the dress for my gal. its pretty! I would like to win the dress for my Jing Ting, she's 2.5 yrs old! I would like to win the dress for three y o Rebekah! I would like to win for my just turned 7 year old girl Arsheitha this beautiful navy cotton dress. I would love to win the checkered shirt for my 2 yr old boy! I would like to win this lovely dress for my daughter. Simply love the dresses & colours. I love to have the dress for my 7 year old girl. She will simply love it & will look awsome . Thank you for hosting the giveaway. Would love to have the dress for my 5-year-old girl. would like to win the dress for my 3yo. Thank you for hosting! I want the dress for my Lil Pumpkin, aged 4.5! Love the bejewelled dress for my Princess! She's 5 year old. I would love to win this lovely bejewelled dress for my girl! I would love to win the shirt for my 5 yo boy Ian. Hope to win the shirt for my son, George, who is 6 years old. Thanks! 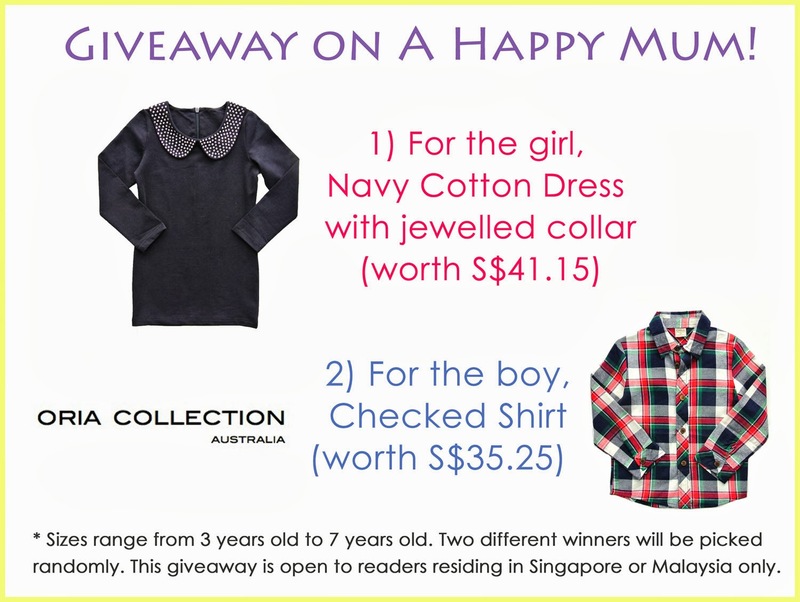 I would love to win the checkered shirt for my 7 yr old boy! My 7 year old girl, Karyn loves the dress. So a dress for my princess please. Thank you very much!